The massing and materials of the building have been developed to reduce the impact of the building on as it transitions east into a lower density neighborhood. The massing of the building is effectively divided into two levels, a 4-storey podium-type level which is clad in brick and addresses the pedestrian realm, and a 3-storey upper volume which is highly glazed and much lighter visually. On the East elevation along Forward Avenue the podium is also divided vertically, a reference to the narrow lots and varied character of the buildings that face this street. The upper levels of the building are pushed back from the podium, further reducing the impact on the street. Whereas street corners are typically highlighted with additional building mass and height, as a gesture towards the scale of the properties to the East the upper levels of the building are further set-back on this side. 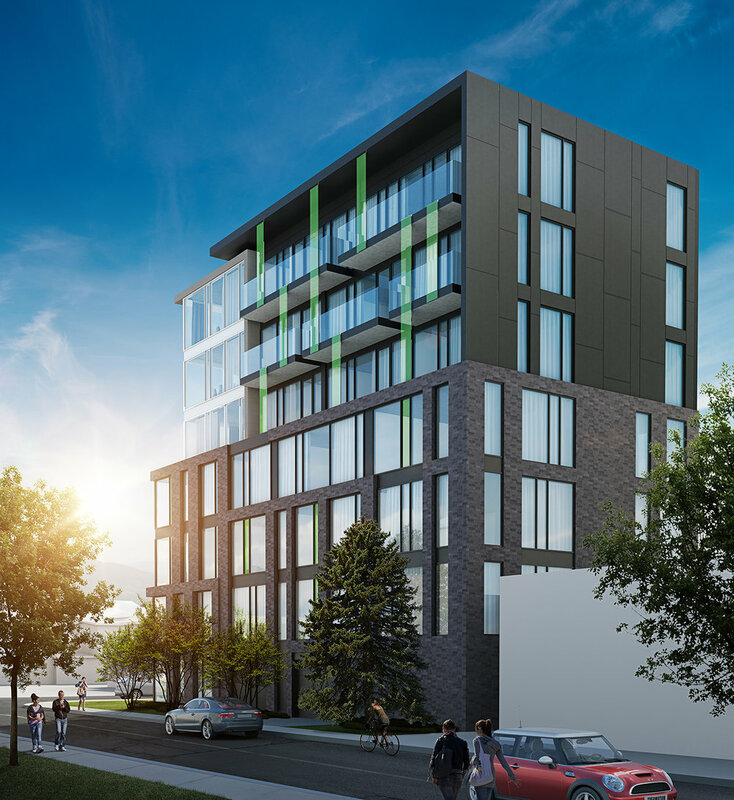 The massing and material selection of this building have been designed to draw attention and towards the West side of the building and the higher density that is found further west along Parkdale Avenue. As the building moves East into the neighborhood the impact of the building is reduced through articulations to the podium, material cladding selections and careful consideration to the building’s massing.